Successfully Added Xiange LCD Projector - 3.8 Inch LCD Imaging System, 200 Lumens, Keystone Correction, 80 To 130 Inches Image Size to your Shopping Cart. Clear crisp display thanks to the 3.8 inch LCD imaging system. Larger than life images with projections up to 130 inches. 3.8 Inch LCD display system and 200 Lumens brightness offers a crystal clear image. Compact size and weight make this project exceptionally portable. If you want a portable and functional projector that offers a large crystal clear image then look no further. 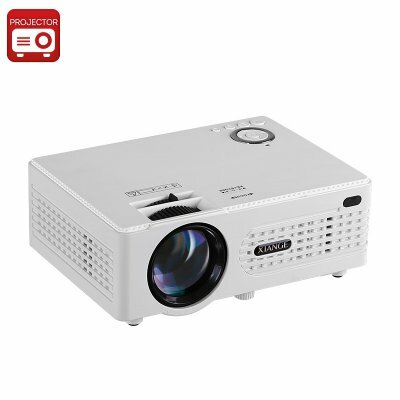 With a 3.8 inch LCD display system, 200 lumens brightness and rich color gamut the Xiange LCD Projector is great value for money. The projected image can be as large as 130 inches and with a projection distance of 1.2 to 3 meters, you don't need a large room to enjoy the full cinema effect. You can choose between front, rear or ceiling project modes so it can be used at home or the office. A compact size and its light weight make it the perfect choice for multipurpose use. you can take it to school use it for the office or turn your living room into a home cinema. With HDMI, AV, VGA, USB and SD card inputs there are plenty of ways to play and share your movies, games or presentations. A built-in 3W speaker can be complemented by independent speakers with the 3.5mm audio jack. This LED projector supports all common video files such as MPEG2, MPEG4, RM, RMVB MOV, MJPEG, DivX, VOB, and MKV. You can easily connect your laptop, desktop computer or games console with the wide array of ports. The LED lamp has a 30000-hour life expectancy so this compact LCD projector will bring years of reliable service. This LCD projector comes with 12 months warranty, brought to you by the leader in electronic devices as well as wholesale AV gadgets..